TRAVEL.org - Switzerland. 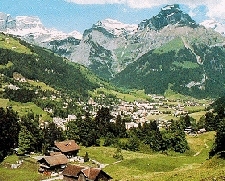 Hotels in Switzerland, tours, activity info, and general facts. Inghams Tours - If you're considering a ski holiday or a walking tour in Switzerland, Inghams is the tour operator you're looking for. SunTransfers.com - Low-cost airport transfers - Low-cost, reliable taxis, minibuses and coaches from over 70 airports, including Geneva, Switzerland. Switzerland by Prioritylounge.com - A travel guide to plan and book your vacation in Switzerland. Plan and book online. Using a cellphone in Switzerland - info from Cellular Abroad. Car Hire Switzerland - Get cheap car rentals quickly and securely online with Firstcarhire. Geneva Info - One stop shop for City information, walking tours, guides, hotels, and restaurants. Altogold - Holidays in Switzerland - Altogold provides self catering holidays in the beautiful regions of Swizterland. Zermatt Hotels - Compare prices of all hotels in Zermatt. Renaissance Zurich Tower Hotel - Welcome to the one of the newest luxury hotels in Zurich, the Renaissance Tower. With well-appointed guest rooms & upgraded amenities, this luxury hotel in Zurich is a welcome retreat. HolidayCity Zurich Hotels - Zurich hotels, accommodation and apartments with maps and photos. Zurich Hotels and Accommodations - Discounted rates on Hotel rooms, Car Rentals, Flights, Vacation Rentals. Discountedhotels.com, your complete travel resource.